The Agency app in Opus 23 takes pharmacogenomics to the next level. Relying on the extensive Opus 23 database of published research detailing gene expression data linked to natural products, Agency provides a visual representation of their interactions web. Multiple agents can be displayed, allowing the clinician to synthesis multi-target strategies. In the image above we see the expression pattern for co-enzyme Q10, a powerful anti-oxidant. Co-enzyme Q10 (COQ10) is the light green node in the center. The tan nodes surrounding it are the genes that interact with COQ10: Red edges (connecting lines) with a ‘T-bar’ indicate that COQ10 inhibits the expression of that gene. Green edges with an arrow indicate that COQ10 enhances the expression of that gene. Genes with a reddish color indicate that they may have compromised function in the current active client in Opus 23. Other agents with especially high abilities to influence the expression of any genes associated with COQ10 are at the periphery of the map and colored gray. The effect of COQ10 to antagonize vascular endothelial growth factor A (VEGFA) might be enhanced by concurrent administration of wogonin (Scutellaria biacalensis), honokiol (Magnolia officinalis) and matrine (Sophora flavenscens). Notice that this gene is compromised in the current client. Like virtually every data depiction in Opus 23, clicking on any node brings up the information popup for that entity: clicking on an agent node brings up its expression data (with links to PubMed citations) while clickin on any gene brings up its genomic data any relevant SNP data associated with that gene. In addition to its network (web) depiction, any natural product can have its gene expression data depicted as a polar chart. 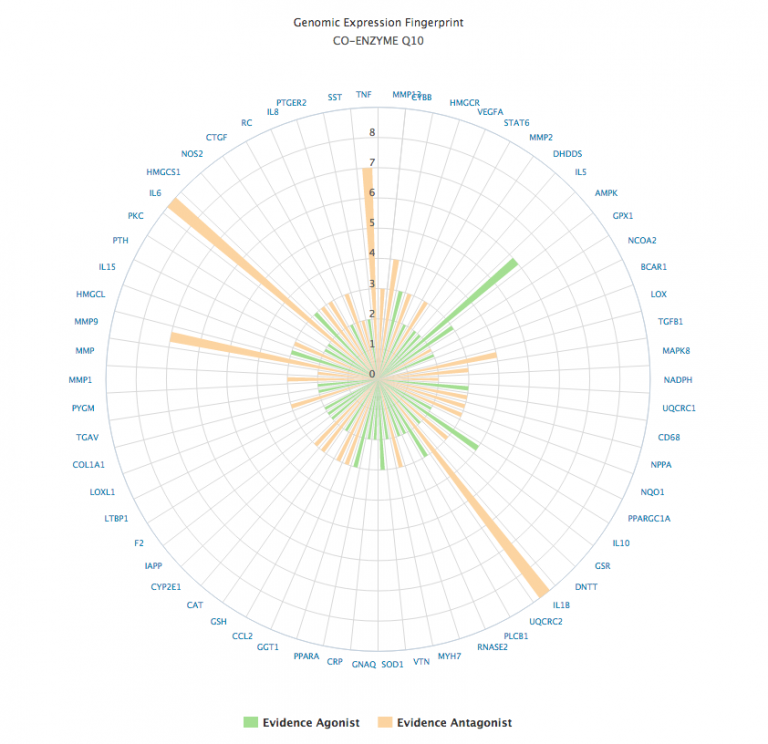 The polar chart format display the gene expression data as orange if the evidence is suggestive of an antagonistic effect, or green if the effect is agonistic. The strength of the evidence is computed from the sum total of the evidence, scaled by the type of experimental subject (in vitro, animal or human study). 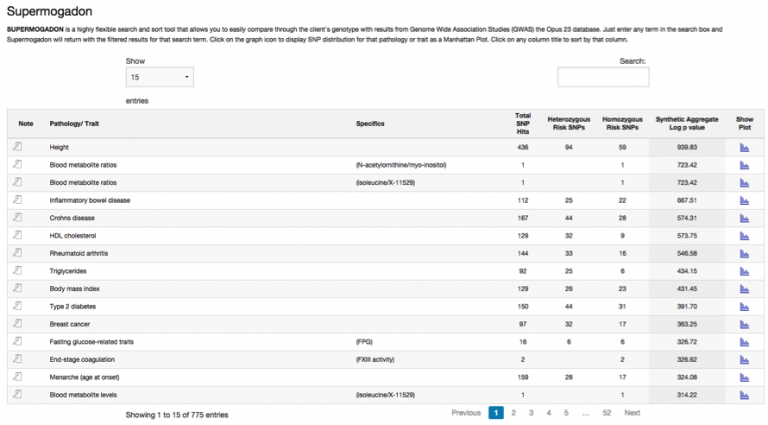 SuperMogadon is a highly flexible search and sort tool that allows you to easily compare the client’s genotype with results from Genome Wide Association Studies* (GWAS) through the Opus 23 Pro database. As you can see there are over 50+ pages of GWAS data in SuperMogadon, which would make grinding through the data rather impractical. Like most data displays in Opus 23 that deal with large amounts of data, SuperMogadon features a ‘filterable’ display. Type full or partial search terms into the search box at the upper left hand corner and SuperMogadon immediately displays only those results. Click on the graph icon to display SNP distribution for that pathology or trait as a Manhattan Plot. Click on any column title to sort by that column. Clicking on the blue graph icon in the ‘Show Plot’ column will launch the SuperMogadon Manhattan plotter for that disease/trait. TheSuperMogadon Viewer is a GWAS Manhattan plotter, a type of scatter chart used to display data with a large number of data-points. Genomic SNP coordinates (marked by chromosome) are displayed along the X-axis, with the negative logarithm of association P-value for the disease or pathology displayed on the Y-axis. Because the strongest associations have the smallest P-values (e.g., 10 −15), their negative logarithms will be the greatest (e.g., 15). In the example above, we see the graph for ‘Type II diabetes’ as a GWAS Manhattan plot. Opus 23 Pro subscribes to the philosophy of ‘TMTOWTDI’ (There’s more than one way to do it, pronounced ‘Tim Toady’.) The program was designed with this idea in mind, in that it ‘doesn’t try to tell the physician how to parse the data.’ Rather, it presents many different frameworks and cross-sections of the available client data, using a myriad of infographic treatments. This (and our ability as a species to excel at pattern recognition) dramatically increases the odds that a noteworthy finding will not go undiscovered. * In genetic epidemiology, a genome-wide association study (GWA study, or GWAS), also known as whole genome association study (WGA study, or WGAS), is an examination of many common genetic variants in different individuals to see if any variant is associated with a trait. GWASs typically focus on associations between single-nucleotide polymorphisms (SNPs) and traits like major diseases.